Tokyo and its environs can sometimes be hard to classify neatly. At certain moments, one might feel as though the entire megalopolis has a uniformity - and at other times one discovers how truly different each corner of the city actually is. There are many layers to be discovered even though the city presents a somewhat consistant ideal. Much of Tokyo was built during the same epoch, and therefore, it shows a very contemporary face to the world. But, in subtle ways, the city shows it’s diversity - culturally, socially, and economically. Given this, it begs the question, what makes Tokyo the city that it is, and how do these characteristics compare with other places? In an attempt to answer this question, I have chosen to compare three diff erent districts - two from Tokyo, and one from the city of Chicago. The neighborhoods I have chosen are Shin-Otuska, Ikebukuro, and the Chicago “Loop”. The format of this paper is presented in small chunks that compare each district on a particular quality, with adjunct photos. Ikebukuro is a vibrant, large-scale pleasure and shopping district in the northwest corner of Tokyo that is very commercial, and divided in half into East/West sections. The West section is focused on entertainment, and the East section is focused on retail. It is a small city within the gigantic metropolis. It is not necessarily a focus for tourists but it is certainly a destination for the Japanese, and also for Chinese immigrants. Shin-Otsuka is a quieter residential and lightly commercial neighborhood slightly northwest of central Tokyo. It is a middle-class Japanese neighborhood, with very few outsiders or tourists within it’s boundaries. There are mainly single family houses in this district, but there are also some larger apartment structures. Retail and shopping exists but only on the main avenues - and the establishments there serve their adjacent community. The Chicago Loop is a bustling area in central downtown. It is a highly active area with commercial and some entertainment zones but it is not on the same level of compression or intensity as Ikebukuro. The scale of the buildings in the Loop are diff erent from the other two Japanese neighborhoods, and that is because, in general, the skyscraper is the most prominent type of structure here. It might be slightly comparable to the Marunouchi area of Tokyo, with its more austere corporate facades. However, it diff ers from that because it is a very diverse area - nearby Millennium Park is very large and attracts many visitors and tourists, and there are some shopping districts here as well. Fig. 1 - General qualities of the three neighborhoods compared. Ikebukuro is bordered by the rail lines (A highway and the JR Yamanote rail line on the north) and highways and the Fukutoshin subway line on the west / south sides. The east side is less clearly defined and extends like a finger all the way to the western edge of Shin-Otsuka. Shin-Otsuka is bounded by an expressway at the west and a main arterial road at the east, and parkland at the south, while the north boundary is very “fuzzy”. The Chicago Loop is defined by the Chicago River at the North and West, the shores of Lake Michigan at the East, and the Southern edge is defined by the La Salle Street corridor, which is an exit corridor for the 290 expressway that ends just to the west. At closer inspection, it appears that the denser urban areas such as Ikebukuro and The Loop have more definite areas because their edges are strongly defined by infrastructural elements or natural edges, whereas the residential edges are much less defi nite, having a sawtooth edge quality. This may be due to the lack of a clear dividing element. Ikebukuro contains mostly mid-rise buildings, a few skyscrapers, but tends to lack smaller structures. Because it is not a corporate zone, the focus is not on skyscrapers (such as it is in Otemachi), and the district is not nearly as dense as Shibuya. The larger buildings tend to be department stores or mall structures. Shin-Otsuka has a much smaller scale than Ikebukuro and it is not as tightly compact as some areas in Tokyo. Houses tend to be larger, and sit on (relatively) more generous plots of land, which is unusual for the city. This probably is due to the income level of the area, which is higher than most. Some larger scale apartment buildings and commercial buildings exist at the main street “hard edges” and the Shin-Otsuka subway station street intersection, but they are not the norm. The superblocks in the Chicago Loop dwarf the Tokyo scale of building subdivision, especially the Shin-Otsuka neighborhood. The superblock as a concept, existed in several historic cities (including Beijing and London) and, in America as early as 1682 in the Penn and Holmes Philadelphia Plan. By 1811, New York’s superblocks had also taken shape. It wasn’t until the Early 20th century that the superblock became a more standardized planning element, bolstered by the automobile as a justifi cation, and Le Corbusier’s Ville Radieuse city plan. Tokyo, specifically does not ascribe to this type of planning technique because of the constant subdivision of lands that took place over the course of centuries. The parcels of land were split apart in the interest of economics and profi table endeavors, sometimes resulting in a chaotic substructure. In Ikebukuro, planning is semi-regularized. Some sections are partially gridded, with wide streets running between them. City blocks are larger, but the plot size of many buildings is not that much larger than other areas in Tokyo. More verticality exists here. In Shin-Otsuka, much of the residential area is laid out on a grid, but portions of it have “medieval” or “fractal” qualities because of the level of subdivision. Roland Barthe’s idea of “hard edges” (taller buildings at the main streets) and “soft yolks” (residential block structures which are lower inside them) exists here but on a smaller scale than other areas of Tokyo. The Chicago Loop is laid out on a large scale mega-grid. Many skyscrapers, including the Willis Tower (formerly the Sears Tower) sit inside the urban grid of streets. In comparison to Tokyo, Chicago is highly regularized, there are few deviations from the gridded urban streets. Also, the scale of the superblocks is highly apparent in the corresponding slides, which are all the same scale. As a side note, the Seismic requirements in Tokyo tend to keep buildings lower (and if they are taller, they are more structurally robust.) Some of the larger-scale megastructures in Chicago would be economically difficult to achieve in Tokyo, which is why most taller buildings in Tokyo are mid-rises. Despite Tokyo’s verticality, there is a restraint to some of the urban development. Ikebukuro is situated at a high elevation compared to the surrounding areas – it sits on a bit of a plateau that defines the outskirts of the district, at approximately 65 meters above sea level. During the Edo period, these higher zones would have been locations for Samurai palaces and aristocracy because they were safe from flooding. Shin-Otsuka is lower than Ikebukuro but still 35 meters above sea level. Also, it is more topologically diverse than Ikebukuro – it is quite hilly in certain parts. In contrast, Chicago and the Loop are very flat. Sea level is somewhat irrelevant since it’s not near the sea, but the lake level fluctuates and flooding can be an issue at times. Tokyo’s varied topography means that in higher zones, there are “vistas” to be had, and planning methods take this into account. In the Loop, the vistas you might see would be urban skylines (as viewed from a river canal corridor or from the park) or the lake front at the water’s edge. Ikebukuro has a wide spread demographic but it is considered somewhat trendy - especially the west side which has a younger, freewheeling vibe to it (perhaps because of the large entertainment district there.) There is also a large Chinese population – there is a focus here for Chinese Immigrants, which has risen sharply since the 1980’s due to China’s reforms and policies (according to Kiyomi Yamashita, professor of ethnic studies at Tsukuba University.) There is even a small dispute brewing as to whether or not there will be a need to develop a “China Town” in Ikebukuro. Today, the large existing Chinese social infrastructure is appealing to those just arriving in Tokyo. Shin-Otsuka contains mostly professional and middle-aged citizens and families who are attracted to its quiet and safe environs. Shin-Otsuka houses almost exclusively Japanese citizens, but there are some foreigners there as well. The Chicago Loop is a mix of middle and upper class residential folded into a heavy commercial area. It is a quite mixed and racially diverse area, including lots of foreign tourists. Because there are many office towers and skyscrapers as well, a mix of older and young people meet, work and play here. In comparison to Tokyo, the Loop might be more demographically diverse, but that could be due to the overall qualities of the citycore that attract tourism, both local and international. In Ikebukuro and Shin-Otsuka, a decidedly Japanese urban environ still dominates, perhaps because other neighborhoods (such as Roppongi) have been hotbeds for foreigners to congregate. Ikebukuro has a well-coordinated infrastructure. A lack of conspicuous electrical poles prevents a marring of the scenery as in other areas in Tokyo, although they do exist in some places. Wide streets, open plazas, and even a formal boulevard that radiates from the east side of the train station enhance the commercial feel. There are wide sidewalks in some areas, which is a rarity in Tokyo. A highway structure also runs along the west, an arterial route that is exposed as a barrier element in the city. Shin-Otsuka has good infrastructure, but an exposed electrical grid is a bit unsightly and uncoordinated - this is typical of Tokyo’s smaller scale urban areas. Narrow sidewalks and streets dominate the area, which help maximize the block structure. The Chicago Loop’s infrastructure is not entirely visible. Chicago is highly planned and most utilities function out of sight and out of mind. However, the one piece of infrastructure that is wholly visible is the train line - the “Loop”, which lends the neighborhood its name. The Loop is, perhaps, Chicago’s version of Tokyo’s elevated expressways through the city. Two of the train lines run above ground here, and form a ring that is concentric to the downtown grid. Here, the train lines are not a barrier, like the highway in Ikebukuro, but rather, it is a connective transportation element that reinforces interconnectivity. Fig. 7 - Infrastructure is either visible or not - there are varied methodologies. Subways and rail lines are central to life in Tokyo. Ikebukuro has one of the largest and busiest trains stations the city and it runs super efficiently. JR (above ground) and Metro (subway) are both centrally located in the heart of the district. Despite this, you may have to walk a bit to get where you are going once you arrive. The main hub for Shin-Otsuka is the Metro Station which is centrally located. There is a stop on the JR line at Otsuka, which is further north (at the edge) of this neighborhood, .6 km meters away (.37 miles) Again, a bit of a walk exists for those who wish to take these lines as they are not always nearby for residents. In the loop, there are both above and below ground rail lines, and several stations are scattered around. The “Loop” (once again) stands for the elevated train loop that runs through the city streets. Less walking is required in this district than in Tokyo to reach your destination because stations are more frequently located on the elevated track and the subway. Ikebukuro has many types of business establishments. The choices are wide and varied, and not as focused on higher-end shopping like Ginza. In the West half pleasure and entertainment dominate, hosting students from the local universities, people from all over Tokyo, and flocks of younger people. This area is a bit grainy, less refined and is the subject of an edgy television show which focuses on the messy lives of certain inhabitants. In the East half, fashion outlets and department stores congregate for a slightly more formal and sophisticated crowd. However, there is a focused area of intense activity in Higashiikebukuro with restaurants and fun that is very crowded. Sunshine City, Seibu, and Tobu are the main shopping hotspots. In Shin-Otsuka, there are plenty of Konbini (convenience stores), smaller family-owned businesses, and larger grocery chains, such as LIFE. Shopping is not necessarily a focus here, but the everyday businesses cater to the needs of the local inhabitants. In the Chicago Loop, there is a mix similar to Ikebukuro with many shopping areas, some entertainment spots, but there is no “zone” for these activities – it is mixed into the city in and around the superblocks. There are wide streets which are sometimes closed off for the frequent fairs and markets that pop up. Convenience stores are not quite as omnipresent as Tokyo, but they do exist in large quantities. There is a mix of small, large, and very large businesses. Most “service” industry business is on the street level, whereas in Tokyo you frequently see advertisements for businesses on the upper floors of buildings. The scale of Tokyo makes this a viable option, as 6 or 7 flights is a “walkable” distance if there are no elevators. In the Loop, this does not exist. Most buildings have lobbies with directories that you can peruse to see what businesses operate there and what level they are located on, and they are accessible by elevator. In Ikebukuro, a lack of exclusively green spaces means the focus is placed mostly on the shopping and pleasure districts. Ikebukuro-nishiguchi Park on the West Side is less of a park than a flat piece of paved land that is open for “hanging around”. In Shin-Otsuka, there are many green spaces and tree-lined streets. Kyoikunomori Park, and Otsuka Park are nearby, as well as the Gokokuji Temple site, mentioned earlier. Millennium Park, a well-known tourist attraction is a focus within the “Loop” neighborhood. Compared to the parks in Tokyo, it is less contemplative, and more whimsical. While Tokyo’s parks are revered for “man-made” natural beauty, that is a secondary focus at Millennium park. The primary focus is a diverse range of spaces and activities within the park. The scale of it is very large and very open although there are some intimate moments like there would be in a garden in Tokyo. In Chicago, the city is not “integrated” with the parkland as it is in Tokyo. The parkland was planned to be a lake front heritage site, so it was designed as a retainer and setback for the natural water’s edge, pushing away the dense cityscape that sits behind it. In this regard, the park is both pleasurable and utilitarian. The temples in Tokyo are specific to eastern worship, traditional-looking, and have a high level of craftsmanship. I mention this separately as a category because I believe that this particular element is something that can be interpreted as “Japanese”. There is a high amount of care taken to establish these as “refuges” from the city. In Ikebukuro, Honryuji Temple (east) is the largest Temple and it is not centrally located. In Shin-Otsuka, Gokokuji Temple exists – one of the oldest in Tokyo (a surviving Edo period building), setback and distinguished by a large park and by Zoshigaya cemetery. It is not central, but it is certainly more “official” than Honryuji Temple. 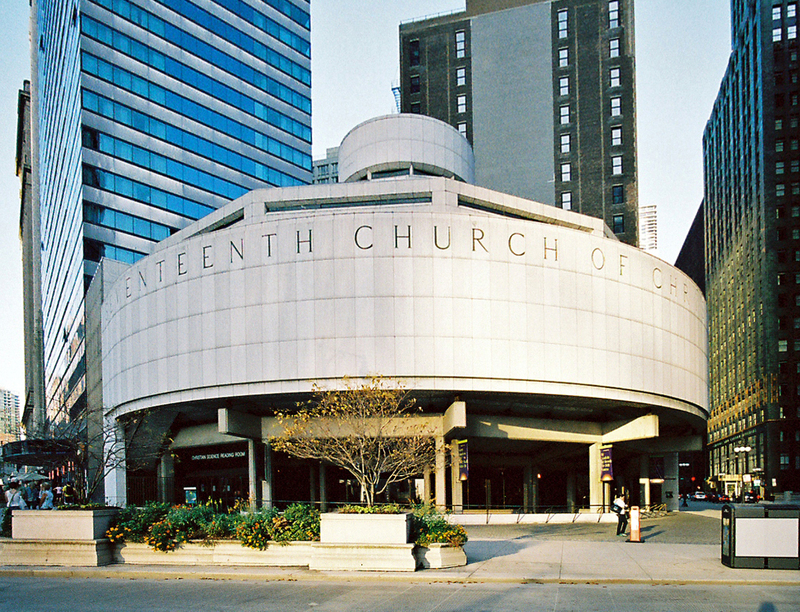 In the Chicago Loop, there exists mostly Christian churches, even a Jewish temple, (as well as a few other denominations) and perhaps most notably the Seventeenth Church of Christ which is a well-known piece of modern architecture. I bring this up because it is a very different statement compared to the traditional style of temples in Tokyo. Here, it seems, there is more of a focus on providing options for religious services, and perhaps, even modernizing these services. Tokyo is a city that lights up intensely at night, and Ikebukuro is no exception to this. It is very bright at times and also visually “noisy”. There are many loud colors and lots of wares being advertised. Competition for your attention seems quite fierce. Shin-Otsuka is much darker at night than Ikebukuro (being a residential area) but it has occasional flashes of the brighter areas of Tokyo at main intersections and large arterial streets. Nothing on the level of visual assault like Ikebukuro, however. The Chicago Loop can be austere – signage tends to be more subdued for buildings except in specific areas. Many establishments and buildings own the entire block, and as mentioned earlier, the multi-level office spaces have directories in the lobby as opposed to reading signage from the street. Sometimes you will see signs in the windows - but this is infrequent. In Tokyo, advertising is much more overt because of the verticality of the business layouts. In the Loop, the brightest signs and lights can usually been seen at the street level only. Tokyo has an organic quality to the way it operates, despite the fact that it was also formed with certain disciplines in mind. Urban theorist Fumihiko Maki touched on these aspects in his 1964 paper entitled Investigations Into Collective Form. In it, he mentions how urban societies “evolve” and compose themselves into groups of buildings that have reasons to be together. To my mind, this is how much of Tokyo operates. Ikebukuro is a collection of pleasure and shopping buildings all in one place, and Shin-Otsuka is a somewhat residential district in the city. These clusters of buildings create meaning with one another, they each form a nexus of interest. Chicago’s Loop, on the other hand, is much more of a “mixture” of urban qualities and demographics. Ikebukuro has density and intensity and a noisy visual quality that is different than the other two neighborhoods, but it is also slightly homogeneous in some ways. Competition for attention in Ikebukuro seems to drive much of the way things operate there, but the Japanese themselves do not embody this aspect - rather, the way of life here seems to represent a more collective ideal, expressed socially. Shin-Otsuka is much more understated, not as homogeneous, and not flashy in any regard but perhaps a bit more individualistic– good for family life since it is away from the action (an attractive quality.) The Chicago loop is not as excessive or wild as Ikebukuro, but the range of architecture there is a substantial treasure. Architecture has always been part of the heritage of Chicago, from the birth of the skyscraper and the Chicago window to now, with the architecture becoming increasingly diverse, gaining a contemporized ideal. The uniqueness of Tokyo is a result of the social, economic, and political forces that have shaped it. In a certain regard, hi-tech has met happenstance with the rapidity of development in Tokyo. It would also be prudent to point out the compressive forces that have bound Japan as an island nation, for they have shaped Tokyo’s development. Tokyo has a modern, expressionistic desire that looks towards the future while pausing to refl ect on the past, utilizing the realities of now. It has managed to retain a sense of heritage but somehow leap forward at the same time. It is this dichotomy that makes the city what it is: an evolving metropolis. PROMPT: While studying abroad in Tokyo, we were given the opportunity to compare and contrast two Japanese neighborhoods with a neighborhood of our own Choosing in the United States. Research on several aspects of each neighborhood was conducted, to arrive at a conclusion about similarities or oppositions that may or may not align between Japanese and American culture. My brief analysis after three months in the country was not intended to be a deeply critical stance, but I did spend many thoughtful hours pondering the elemental differences between East and West.